Graduation rates in Oregon rose in the 2017-18 school year, marking the fifth year in a row for rates to rise, according to the most recent release of data from the Oregon Department of Education. The statewide graduation rate of 78.7 percent jumped up more than 2 percentage points from the year prior, according to data published on Thursday, Jan. 24. The increase in rates reflects the percentage of students who entered high school in the 2014-15 school year who went on to earn a diploma within four years. The rate of students in Oregon who graduated within five year years of entering high school also increased from 78.9 percent to 80 percent in the 2017-18 school year. "It's important to remember that we are talking about students, not statistics," Oregon Department of Education Director Colt Gill stated in a press release. "In this case, a two-point increase in graduation means an additional 950 students getting their diplomas within four years of starting high school." While the rates show an increase, the state still falls behind the national average rate of 86 percent, according to the most recent data from the National Center for Education Statistics in 2015-16. In Columbia County, graduation data for both groups varied from district to district. 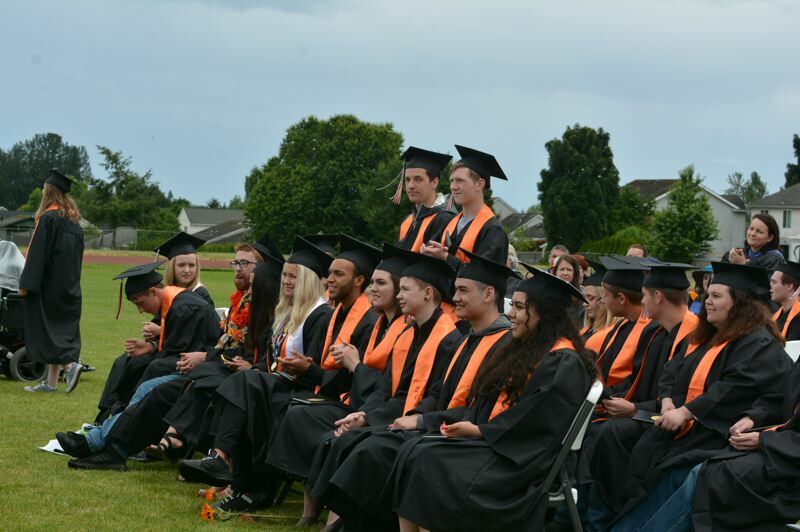 The Scappoose School District saw an overall increase in graduation rates. The district boasts a 94.3 percent four-year graduation rate for the single school year, up from 93.1 percent the year prior. Looking deeper into the data, however, there has been a slight overall drop in four-year graduation rates at Scappoose High School, specifically. The high school reported 94.3 percent four-year graduation rate, down from 95.1 percent. Data from the 2017-18 school year marked a high point in the five year graduation trend for the school, which helped it earn a reputation as one of the top 10 graduation rates in the state, according to rankings published by the Oregonian/Oregon Live last year. The district's five-year graduation rate was also reported at 94.6 percent, up from 93 percent. The state average of five-year graduation rates was 80 percent in 2017-18. "As we celebrate this success, we also immediately turn to the work of building upon what is working well and systematically making continuous improvements that allow every student to reach their potential. We still have 6% of our students who are not graduating, and because every student's success is important, we will continue to work hard to meet the needs of all learners by providing increased and ever-improving educational opportunities," Superintendent Paul Peterson noted in part via email when asked about the rates. In St. Helens, the overall graduation rate remained nearly unchanged. The 2017-18 school year saw a 74.2 percent graduation rate compared to a 74.3 percent rate the year prior. The rate falls well below the average, however. The districtwide five-year graduation rate increased from 84.3 percent to 89.4 percent. Columbia County Education Campus marked drastic improvement in its four-year graduation rate. The 2017-18 school year saw 33.3 percent of students graduate in four years. The 2016-17 graduation rate was 19.5 percent. The five-year graduation rate also increased from 32.3 percent to 46.7 percent. The state average of five-year graduation rates was 80 percent in 2017-18. At St. Helens High School specifically, graduation rates were reported at 80.7 percent for the 2017-18 school year, above the state average. The numbers were a drop from the 2016-17 rate of 84.6 percent. A request for comment from Superintendent Scot Stockwell was responded to by the Spotlight's press time Thursday. A full copy of the graduation data can be found on the ODE website.